When ordering wine at Chops Wine Bar or anywhere else, I’d be lost without the help of servers or friends who are more knowledgeable about wine than me. I’m not totally clueless about wine, mind you, but when it comes to properly pairing up a dish with a wine, I could use some help. A variety of factors go into such a decision, and being a rookie wine drinker, I’m not yet at a point where I can make a decision like that and feel comfortable with it. This is what made my trip into Chops Wine Bar for a special dinner sponsored by Merryvale Vineyards - so great. Chef Brian Shreffler and the St. Helena, CA-based vineyard had developed a menu for the dinner that featured three opening courses, a main course, and a finale, with an appropriate Merryvale wine accompanying each course. For me, it was a dream situation. There was no need for guesswork and no need to pester the server or my friend that evening when it came to pairings. All I had to do was sit back and enjoy the combination of Chef Brian’s cuisine and Merryvale’s wines. The dinner began with heirloom tomatoes, EVO, and fleur de sel paired with Starmont Sauvignon Blanc. The tomatoes were moist and tasted as if they’d just been plucked from the garden. The Sauvignon Blanc was a fine accompaniment. It tasted as fresh and alive as the tomatoes, thanks to the sprightly variety of fruit it contained, from peach to citrus to melons. The second course consisted of watercress, roasted beets, Shropshire bleu, sherry vinaigrette, and toasted hazelnuts paired with Merryvale Chardonnay. The intense Chardonnay was in good company with the distinctive flavors of the course, led by the tangy Shropshire bleu cheese. The third course consisted of a smoked pheasant tamale, shrimp roasted corn salsa, cilantro salad, and Chile oil paired with Starmont Merlot. Of all the courses, this was the most flavorful. 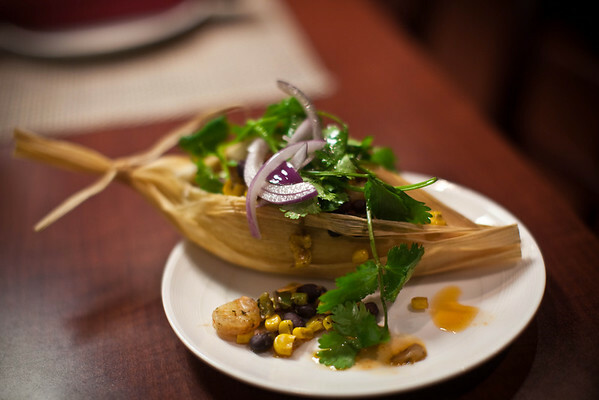 The tamale itself may not have looked intimidating, but everything stuffed inside packed a spicy punch. The silky Merlot was the perfect counterpoint. Seared lamb chop, Moroccan tomato jam, shaved fennel-cucumber salad, whipped feta and grilled naan made up the main course. Merryvale Cabernet was selected for the pairing. The rationale for pairing the dark red Cabernet with the meat, I would come to learn, dates back to the earliest days of pairings, when it was thought that the heaviest of foods (meats) should be paired with the heaviest of wines (reds). For the finale, a roasted apple tartlet, salted caramel, and rosemary ice cream was paired with Merryvale’s Antigua Muscat de Frontignan dessert wine. Of all the wines, this one stood out to me the most. The consistency of the wine was much thicker than that of the others, almost syrup-like. Appropriately enough, this wine was also the sweetest of all the wines I’d had, too. The dessert would’ve been terrific on its own merits, but the wine considerably enhanced the whole affair. In the end, that’s the first, best function of any wine. Even a rookie wine drinker like me can tell you that. People of Fort Wayne: Ride Your Bike to Work!